words by Theo Sakyi Ghana got off to the worst possible start after David Addy had given away a penalty after just ten seconds; Dejan Damjanovic coolly sent Adam Larsen Kwarasey the wrong way. Addy was to blame for lunging into an unwinnable challenge, but it must have been alarming to Ghana coach Kwesi Appiah that the Montenegrins were able to run at the defence with no challenge from kick off. Appiah had put out a more experimental side than expected with Addy starting at left back, Agyemang-Badu partnering Michael Essien in midfield, and Jordan Ayew playing just off Majeed Waris. Instead of playing as a second striker, Ayew operated as more of an attacking midfielder,dropping very deep to pick up the ball albeit without really creating anything. Essien appeared to have been tasked with the job of being Ghana’s main playmaker. He completed some decent passes and even managed to get a good shot on goal but with Montenegro’s strategy being to sit very deep and break on the counter, he spent too long on the ball trying to find ambitious passes or carry the ball, which really slowed down the Black Stars tempo and made it easy for Montenegro to stay in shape, since the ball wasn’t being moved quickly. To be fair, the same could be said for his midfield partner Agyemang-Badu, whose use of the ball wasn’t good enough. Badu’s passing has never been one of his strengths so it’s surprising he’s never been asked to just keep it simple. Essien, on the other hand, seems to have the pressure of being asked to do too much when he’s never really played this role in his career. 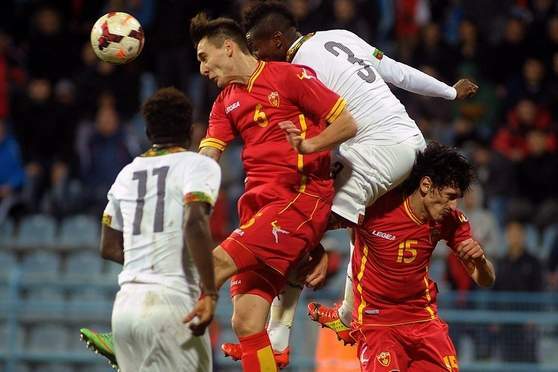 Ghana’s midfield pair were also poor defensively. When Montenegro had the occasional counter-attack, Badu would be a long way ahead of the ball and easily dragged to the flank and Essien having lost his mobility after being ravaged with injuries would frequently overcommit and then after being dribbled past concede fouls. Ghana’s team shape on the whole wasn’t compact enough and it’s hard to pinpoint what their approach off the ball was supposed to be. They weren’t closing down from the pitch or even the halfway line but they weren’t dropping into compact banks of four either. Some players would go chasing the ball e.g. Agyemang Badu, while others were sitting off, making it easy to find gaps to play through. Although there are a lot of issues with the Black Stars at the moment this is one of the more pressing ones. In terms of the attack, it wasn’t all negative. Daniel Opare and Christian Atsu formed a nice partnership at right back and right wing, respectively. Opare got forward consistently and, although he wasn’t particularly productive on the ball himself, he made space for Atsu by overlapping and underlapping and Atsu probably should have had more of an end product when getting into the box where he notably shanked a shot wide. On the other flank, Wakaso seemed to come inside more looking for the ball, not in between the lines but in deeper positions on the flank. This is another reason why Montenegro were able to stay so compact, since Addy was rarely on the overlap and Wakaso was very central nobody stretched play on that side. Jordan Ayew and Majeed Waris weren’t particularly effective together but it helps if we put this into a wider context. Jordan Ayew of late has been playing in the front two for Sochaux, as a second striker just off the front of the main one or on the flank where he cut inside and has a view of the majority of the pitch. On Wednesday, he dropped into very deep areas and although his link up play was actually pretty decent considering he was in areas he never usually operates in, he didn’t create much at all. Majeed Waris performed to a good standard considering the team’s dysfunctionality and made some good runs in behind Montenegrin defence, though they weren’t found with the through balls they deserved. Overall, Ghana were poor all over the pitch except for the right side, contributing to a poor first half. In the second half, Albert Adomah and Samuel Inkoom came on for Mubarak Wakaso and David Addy. Opare and Atsu both switched over to the left flank while Adomah and Inkoom took their positions on the opposite side. Muntari also came on for Emmanuel Agyemang-Badu. Muntari’s use of the ball was good – he misplaced some passes he played some clever balls but the sides problems still persisted, especially the speed of play that was still slowed down by both central midfielders. Atsu and Opare’s work down the right was still looking threatening. Kevin-Prince Boateng came on for Jordan Ayew about ten minutes after half time and improved Ghana’s play in between the lines with some good movement away from the Montenegrin holding midfielders, and he managed to get a few shots on goal. Kwadwo Asamoah replaced Essien in the 66th minute, he moved the ball at a faster tempo than his fellow midfielders and looked to join the attack sporadically. The team were still not creating any clear cut chances, though Boateng was still getting closer with some ambitious shots and after the final change, Asamoah Gyan coming on for Atsu with Boateng moving to the left flank Ghana looked dangerous, mostly set pieces. Montenegro countering occasionally and without Kwarasey’s good decision making to sprint out of his box and intercept a through ball Ghana could have been two behind. Gyan and Boateng both had half chances at the end but couldn’t capitalise. Despite the shock early concession, it was clear from early on that Ghana were the superior technical side, as expected. But they looked poor for the majority of the match, with several structural problems to address. The 6-1 win against Egypt has inflated peoples’ opinions of how good this side really are and was very much an anomaly in the context of the whole qualifying campaign. Ghana, a side used to mostly setting up on the counter in previous World Cups, won’t come up against a side as defensive in the group stage, so may not have as much difficulty finding goals. Fans of the Black Stars will be hoping Ghana don’t go a goal behind early as they’ll struggle to break down deep, compact defences and can be exposed on the counter attack.